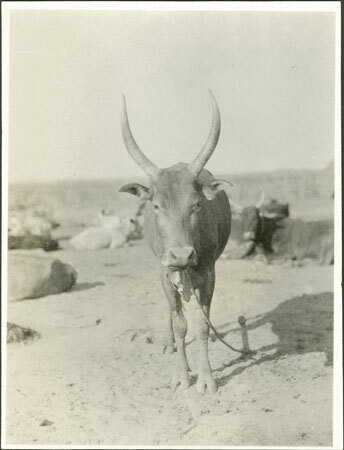 A tethered ox at a cattle looking straight at the camera with upright horns. The favourite ox of a man was the subject of his praise songs and from whom he took his ox-name on initiation and thereby his social identity as a man of the tribe. Note on print reverse ms pencil - "B6 76/3"
Morton, Chris. "Nuer ox" Southern Sudan Project (in development). 03 Jan. 2006. Pitt Rivers Museum. <http://southernsudan.prm.ox.ac.uk/details/1998.346.322.2/>.